Issac plays in his favourite pool on the mountainside. 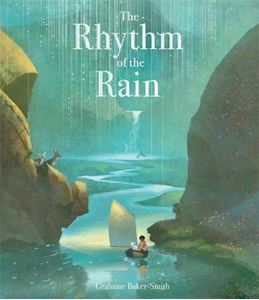 As rain starts to fall, he empties his little jar of water into the pool and races the sparkling streams as they tumble over waterfalls, rush through swollen rivers and burst out into the vast open sea. Where will my little jar of water go now? Issac wonders. On the other side of the world, Cassi welcomes the rain to her parched village . . .
From tiniest raindrop to deepest ocean, this breathtaking celebration of the water cycle captures the remarkable movement of water across the earth in all its majesty. A stunning new non-fiction picture book from Greenaway medal-winner, Grahame Baker-Smith.